During a phone call on Thursday with Syrian President Bashar al-Assad, Lebanese Prime Minister-designate Najib Mikati reportedly praised the Syrian people’s support for his leadership. The premier also criticized the attempts to create strife, in reference to the recent protests in Syria. Similarly President Michel Suleiman voiced his confidence that the Syrian leadership would overcome the instability of recent days that erupted during anti-regime protests. He reportedly stressed on Thursday the importance of Syria’s stability on the economic and security situation in both Syria and Lebanon. Suleiman met Thursday with MP Walid Jumblatt who in turn also expressed his loyalty to the Syrian regime. “Syrian President Bashar Assad’s speech on Wednesday presented positive possibilities that fundamental change will be introduced in Syria in favor of its people.” He said i a statement. Similarly yesterday speaker Nabih Berri a key ally of the Syrian regime called Assad’ speech the “second Corrective Movement,” according to a statement issued by Berri’s press office. 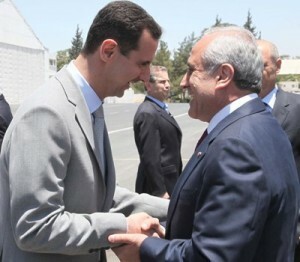 Syria’s stability is an Arab need, and particularly a Lebanese one, Berri also said. According to analysts Assad failed to deliver on the promises made over reforms and instead focused on conspiracy theories and blamed the wave of protests on “conspirators” whom he accused of trying to destroy the country by sowing sectarian strife. -Assad on Wednesday issued Legislative Decree No. 44 for 30/3/2011, which amends the first article of Legislative Decree No. 40 for 24/3/2011 on increasing monthly salaries and wages. -Syria is forming a judicial committee to form new legislation and lift Syria’s state of emergency, in force since 1963, the Syrian Arab News Agency (SANA) reported Thursday. “Under a directive by President Bashar al-Assad, a committee of legal experts has been formed to study new laws on national security and counter-terrorism, in order to pave the way for ending the state of emergency,” SANA said. “The committee should finish its work by April 25,” it added. The protesters don’t seem to trust Assad’d motive and called for rallies across Syria after weekly Muslim prayers on Friday April 1 , upping the pressure on the Syrian President. “Our date is Friday, from all houses, all places of worship, every citizen and every free man, to all squares, for a free Syria,” said a statement posted Thursday on Facebook group The Syria Revolution 2011. What Lebanon desperately needs is a genuine revolution that eradicates this entire corrupt political establishment which includes both the so called March 8 and March 14.